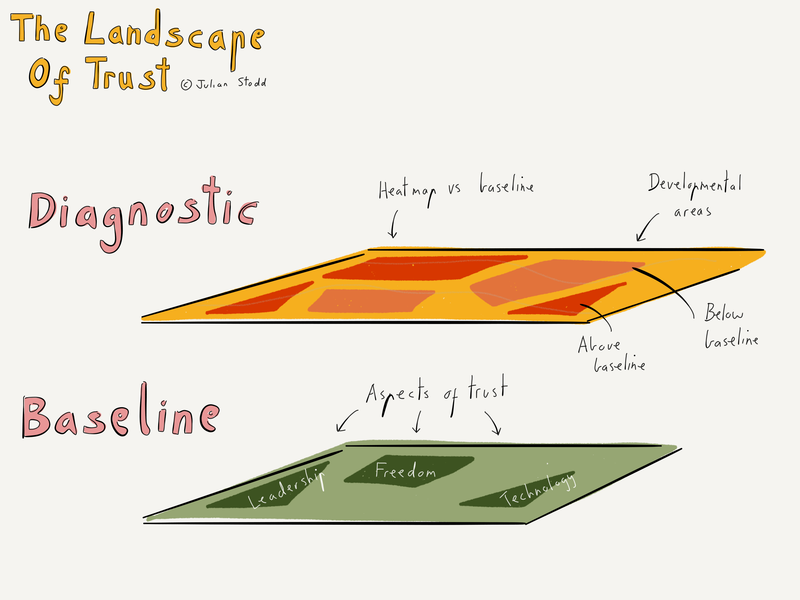 I’m sharing a sketch today illustrating how I anticipate the diagnostic to work around the Landscape of Trust. The research at the moment is intended to surface all the locations within our subjective understanding of what trust means, and to chart them on a landscape. The diagnostic will be in the form of a survey that an organisation can use to chart its own results against this baseline. I was talking this through with a friend yesterday and coming back to the point that I explicitly don’t want it to produce a trust score, but rather a heat map that illustrates developmental areas: where is the organisation operating above a baseline, and where is it below it. I’ll write more about the research methodology later, but the intention in the second phase is the prototype this across different regions, different sectors, and different organisations, to explore how localised the results may be. Partly this is in service of how trust may vary within a culture, if we subscribe to the notion that the many organisations the stated global culture is largely aspirational, and instead what they live is a series of highly coherent, but deeply fragmented, subcultures. My hypothesis is that the subcultures will share large parts of the landscape, but may differ in key areas. For example, I’m anticipating that aspects of trust relating to a quality, and probably to gender roles, will differ by geography and culture, but I expect there will be other more nuanced effects too. I’ve also started thinking about some of the developmental pathways that will come out of this diagnostic, largely because I have the opportunity to prototype one next week. 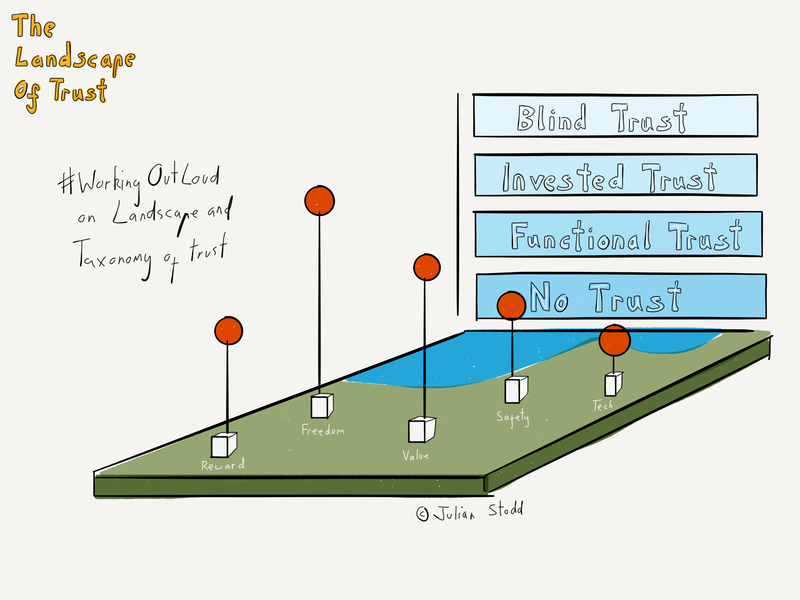 The following sketch will indicate the direction I’m going with this: it’s intended as a tool that an individual can use to explore the foundation of trust, the expression of trust, and the experience of trust. These broadly relate to my intention, my action, and my impact. 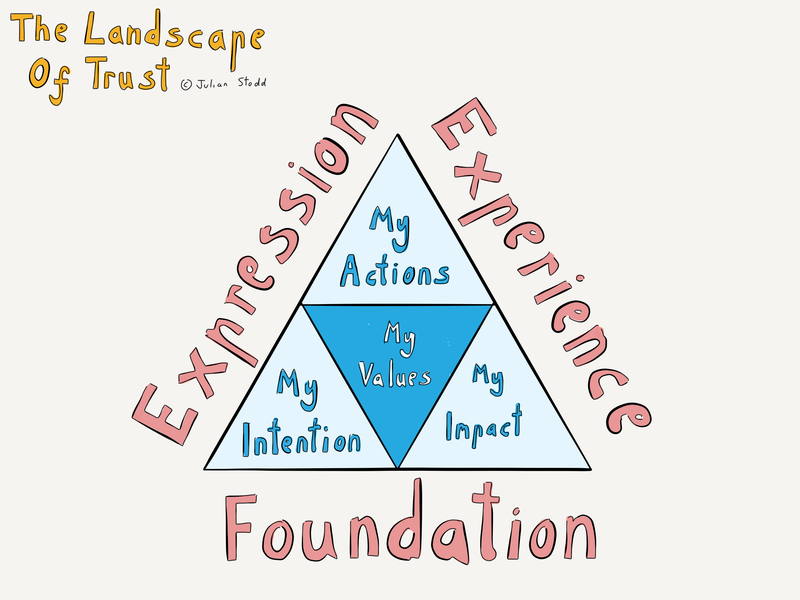 At the heart of these will be my individual values, which is effectively what we are exploring when we map the overall organisational landscape. Clearly this is early stage work, but within the body of work around the Landscape of Trust I’m intending that there will be both organisational tools to diagnose and direct action, and individual tools to explore how we each take part in creating and perpetuating culture in all its aspects. It’s worth noting that at the heart of this is the understanding that even a highly coherent culture can maintain multiple viewpoints of what is right, what is fair, and even what trust means. The idea is not to generate a uniform landscape, but rather to clearly recognise that every individual and every organisation will have a landscape that is different. By making this landscape visible, we are better able to chart our way through it. This entry was posted in Trust and tagged Development, Diagnostics, HR, Landscape of Trust, Leadership, Networks, Organisations, Trust. Bookmark the permalink.